is a short walk from the pubs south on Main St.
Greenville, SC Located in the northwestern corner of the lovely state of South Carolina, Greenville is a calm, relaxed, city with a distinctly rural feel. Greenville has old buildings, trees, parks, and a nice zoo to visit with the family. 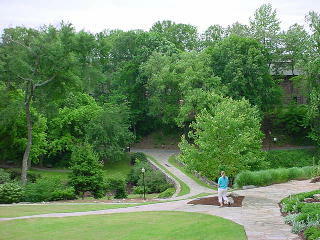 The Reedy River runs right through town -- meandering from the western to the southern side of the city limits. Life seems to be carried out a little slower in Greenville than in other cities, but the citizens don't seem to mind. The center of downtown has recently been revitalized into a beautiful pedestrian mall with shops, restaurants, Reedy River Falls Historic park, and, of course, great beer spots to enjoy. This makes for a fine pub crawl for beer fans seeking tranquility and relaxation along with their pints of ale. Greenville has some pretty strict laws governing the sale of alcohol, so be sure not to try this pub crawl on a Sunday -- you'll find most of these spots will be closed. Any other afternoon of the week, you start by finding your way downtown to North Main Street -- the center of activity, shopping, and dining in Greenville. This wonderful New Orleans cafe and bar is on N. Main across from the Hyatt complex. There is a fun, Mardi Gras type feel to the bar area with live music on Friday nights. They have also added a beautiful restaurant to the right of the bar. 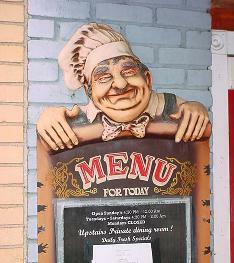 Betty's is open for lunch Monday to Friday and dinner Monday to Saturday. There are seven beer taps that include some tasty favorites such as Woodchuck cider, Bass, Redhook, and regional microbrews. Food items include: catfish po' boys, blackened burgers, jambalaya, crawfish pizza, oysters on the half shell, seafood quesadilla, and creole pasta. 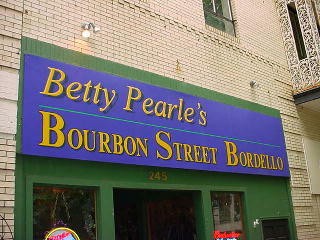 The menu states "the spirit of Betty Pearle Boudreaux, the infamous New Orleans madame, brings to Greenville a taste of the sultry and spicy heritage that made her renowned in and around the French Quarter." Walk right as you leave Betty Pearle's and you'll quickly see Greenville's famous brewpub on your right. Walk in and you'll know that you've found a brewpub with personality, charm, and uniqueness (and the beers are tasty too). 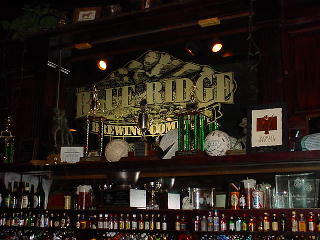 Blue Ridge offers a nice house Blonde Ale with a percentage of wheat -- it is definitely a refreshing thirst quencher. 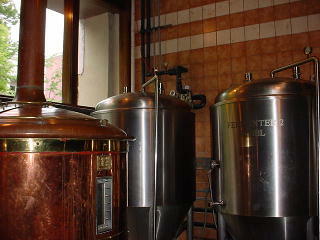 The Rainbow Trout Amber Ale and Colonel Paris Pale Ale are also very enjoyable brews. A roasty Stout and other seasonal beers are offered on a regular basis. The brew room at Blue Ridge is not a room at all, but an area set aside in the front of the brewpub with the mash tun, brew kettle, and fermenters right out in the open. Appetizing food highlights the menu at Blue Ridge with excellent sandwiches, steaks, catfish etouffee, fish, and quite a selection of "wild game" including ostrich, buffalo, wild boar, rabbit, and quail. There is a long, beautiful, wooden bar that always seems to have friendly bartenders behind it, and the bottle collection on the back wall is very impressive in itself. 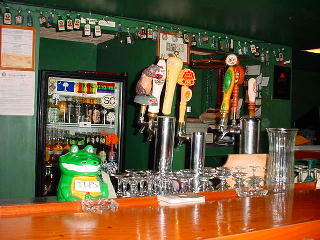 If you are out for beer and quiet conversation, be sure to stop by early as the place is always packed at nighttime. Turn right out of Blue Ridge and walk past North Street and turn left onto East Coffee. You'll spot Addy's on your left. What a surprise to find a personable little Dutch pub and café in the middle of downtown Greenville! I've had some great times and wonderful beer here. Addy's likes to rotate their bottled beer menu often and include as many tasty brews from the Netherlands, England, Germany, and Belgium as they can get their hands on. The place has a true Dutch feel to it with quaint wooden tables, European menu, and reproductions of paintings by the Belgian master Bruegel adorning the walls. There are four draft beers and over 40 bottled selections at Addy's, but be sure to ask the bartender if they are offering any outstanding Belgian selections when you visit. Sounds of live jazz fill the place on Tuesday nights at 9 PM, and food is served most nights until around 10:00. 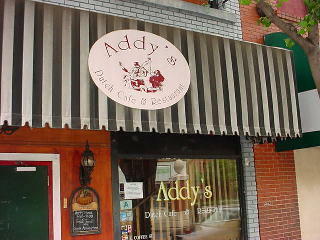 Addy's opens at 4:30 everyday except Monday (closed). You'll want to linger into the wee hours of the night at this little taste of Amsterdam, but be warned that some of Greenville's best beer is yet to come! From Addy's, head back to North Main Street and walk left. Go one block to West Washington, turn right, and you'll see Barley's on the left. The original Barley's is located in Asheville, NC and proved to be so popular that the owners decided to open a second location. The Greenville Barley's is an airy, open pub with plenty of seating at tables and at the bar. Any pubcrawler will be amply impressed by the row of 25 draft beer taps and almost 40 bottle beers on display behind the bar. If you are not familiar with one or two of the draft beers, the bartenders are usually willing to accommodate you with small samples. Some of the best pizza, dripping with thick, hot, juicy toppings, makes its home at Barley's, and you'd be missing out if you don't order at least one slice. 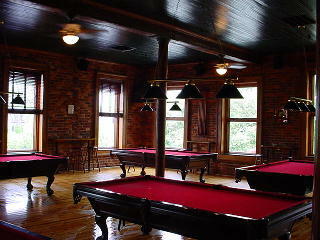 Be sure to visit the beautiful upstairs pool room too. 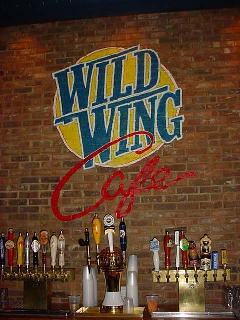 Wild Wing Cafe is next door to Barley's and offers patrons of downtown Greenville phenomenal wings and beer. This two story restaurant and beer bar is part of a popular chain of establishments that specializes in wonderful sandwiches and chicken wings in a multitude of tasty sauces. This Wild Wing has live music upstairs on a regular basis and boasts one of Greenville's best draft selections. With microbrews, regional local beers, and several impressive imports, Wild Wing will have a beer to please anyone. The interior of the pub is very attractive with some fun beer art and collectibles on the walls and big, comfortable booths for conversation. Wild Wing is open for lunch and dinner. After you have checked out Wild Wing, walk back to Main Street and take a right. Go two blocks and walk left down East Court Street to Connolly's on the right. 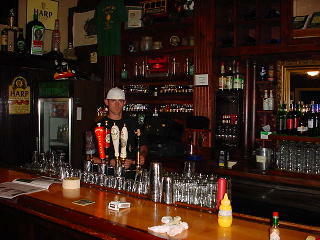 This is a huge Irish-style pub with a main bar to the right and a big secondary room with dart boards on the left. 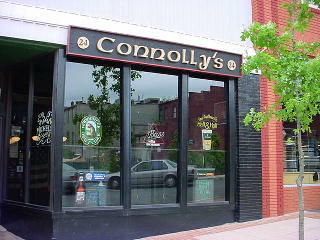 Connolly's is one of the best places in the Southeast to drink a pint and have an enjoyable game of darts. 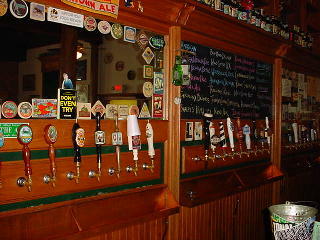 There are seven nice draft beers that are always served fresh and around 27 bottled beers from around the world. Be sure to check out their fine selection of authentic pub snacks from the UK in the vending machines to the rear of the dart room. The pub is open Monday to Saturday 4:30 PM to 2:00 AM.